Blue Lake has been the scene of some great race races, especially when it hosted the Old Danner race and the Mount Hood/Three Rivers League Cross-Over held on Thursday saw some very strong races at least at the front and they ought to make the national rankings people take note. Paige Rice of St. Mary’s Academy led the way with a victory in the girl’s varsity race in a time of 18:12, which is the best in Oregon this early season. Paige went out early and only Kelly O’ Neill of Lakeridge had the temerity to stay with her. She noted that she was at the mile mark around 5:40, because she "got out a little bit fast as always." By the 3K mark, which she hit at 5:45, Paige had opened up a four second lead, which continued to expand throughout the race. 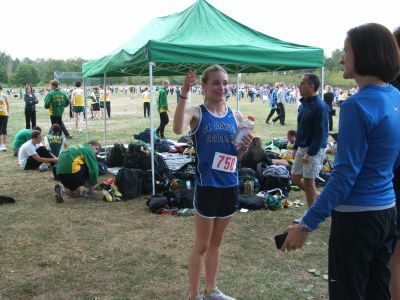 Kelly O’Neill ended up running the reminder of the race essentially on her own and finished with a time of 19:28, which was 27 seconds ahead of Bella Gazzola of St. Mary’s Academy. Liz Newman of Lakeridge placed fourth in a time of 20:01 & was followed by SMA’s Celeste Raymond who ran 20:16. Rachel Crawford of Oregon City recovered from her off day in the desert heat at Hermiston last Saturday to take sixth in a time of 20:17, as she finished two seconds ahead of Carly Januzzi of St. Mary’s. Mandie Maddux of Barlow (20:20), Maggie Riley of Oregon City (20:21) & Haley McDonald of Gresham (20:23) rounded out the top ten. St. Mary’s overwhelmed its competition in the team scoring with a low of 27 points. Second & third for the girls’ team went to Lakeridge with 115 & Grant with 132. Central Catholic, which ran four freshmen, won the guys’ team crown with a total of 71 points, as they edged Barlow’s total of 75. Lake Oswego placed third with 92. Kyle Thompson of Central Catholic is only a sophomore yet he runs as if he were an upper classmen. He went out reasonably hard especially for this time of the season, but no one went with him. He then widened the gap to claim victory in a time of 15:44. He had assumed a number of runners would go with him but found himself alone & then he kept pushing. His mile was around 4:50, which was too rich for the pack. Jackson Haselnus of Barlow claimed second with a 16:01 clocking, which was five seconds ahead of Nathan Normo of Lake Oswego. Fourth place went to Jacob Campbell of Barlow, who ran 16:08. It was a cool day, especially after last week’s temperatures in the 90’s and with overcast skies, which after the race turned to rain clouds, it was an ideal day. Numerous runners availed themselves of the conditions and Mubark Mebrat of Lakeridge was one of them as he ran 16:22 to earn sixth. 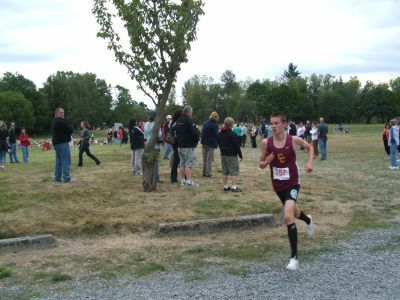 Nathan Meeker of Oregon City ran 16:27 to place seventh & was followed by Todd Macdonald of Lake Oswego, who ran 16:31. Jordan Landstrom of Central Catholic ran the course in 16:33 to place ninth and Ian Stevens of Reynolds finished in 16:37 take tenth. Special mention needs to be given to Julia Renner, who led the JV field until she made an incorrect turn near the end of the race. The course was not clearly marked and she made a wrong turn along a line of streamers and the people nearby failed to correct her. That error caused her to finish in 8th place instead of the first, which she seemed to have been clearly headed for only a bit before. These things happen from time to time in our sport but better marking makes it more difficult to wander of course, and it is a shame to see a hard earned victory be taken without an honest chance.